SignatureGem LCD 1x5 is a complete and versatile pen-input system for the capture of signatures used in countertop, desktop, or portable applications. 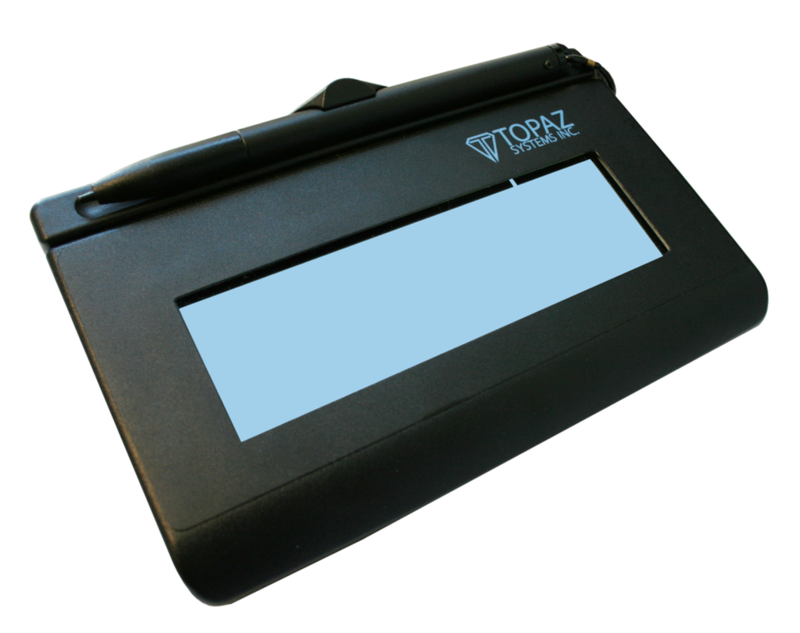 The LCD can also be used to display text and graphics from the host computer and pen-tap hot spots allows users to navigate between multiple screens and forms, inputting information or checking preferred options. Bundled software includes development tools for ActiveX, Java, C++, .NET, and Unix/Linux plus plug-ins for MS Word and Excel and Adobe Acrobat. This product has a 3 year warranty. SigLite LCD 1x5 is a complete and versatile pen-input system for the capture of signatures used in countertop, desktop, or portable applications. The LCD can also be used to display text and graphics from the host computer and pen-tap hot spots allows users to navigate between multiple screens and forms, inputting information or checking preferred options. Bundled software includes development tools for ActiveX, Java, C++, .NET, and Unix/Linux plus plug-ins for MS Word and Excel and Adobe Acrobat. Product has a 2 year warranty. 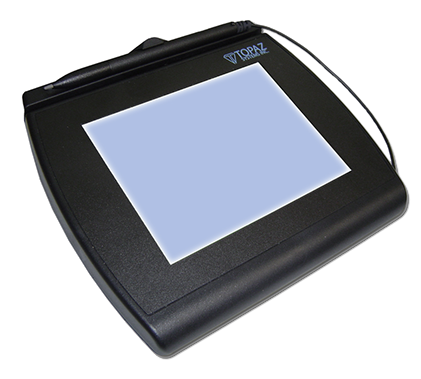 The SignatureGem LCD 4X5 is an advanced biometric electronic signature pad with large, bright QVGA (320 x 240) TFT LCD that captures and displays hi-resolution electronic ink under the pen tip for a natural signature. Bundled secure software APIs provide for interactive text, graphics, and pen-tap hotspots and checkboxes which enable users to navigate screens, read agreements, and select preferred options before signing. 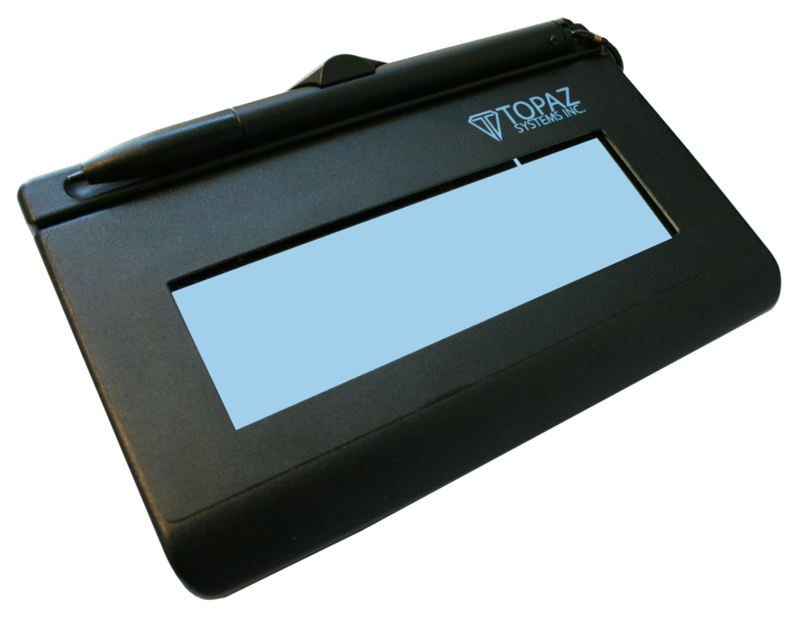 Topaz “BHSB is dual-interface and can be used in either HID USB, (cable provided), or serial interface (serial cable sold separately). “BBSB model provides a Virtual-Serial USB connection. SE model used in certain custom applications. Product has a 3 year warranty.